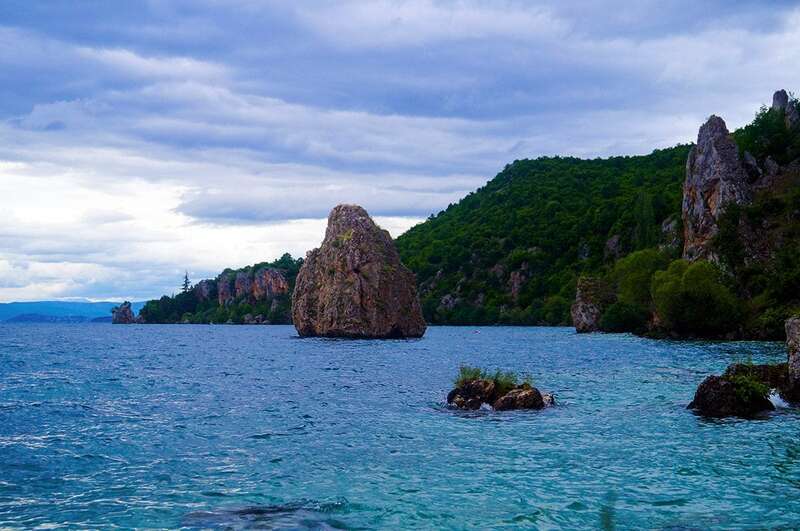 Below are listed the most amazing natural and man made landmarks of North Macedonia. Devil’s Wall – Eastern. Weird formation – natural stone wall which looks as if it is man-made. This is a 12 m tall and some 2 m wide wall, made from giant stones. Some stones are up to 4 tonnes heavy. Matka Canyon – Skopje. Beautiful canyon with important natural and man-made values. Area is rich with endemic species of plants and animals, here are found some 10 caves. Among these caves is one of the world’s deepest underwater caves (Vrelo Cave) and also medieval cave monasteries with frescoes. Stone town of Kuklica – Northeastern. 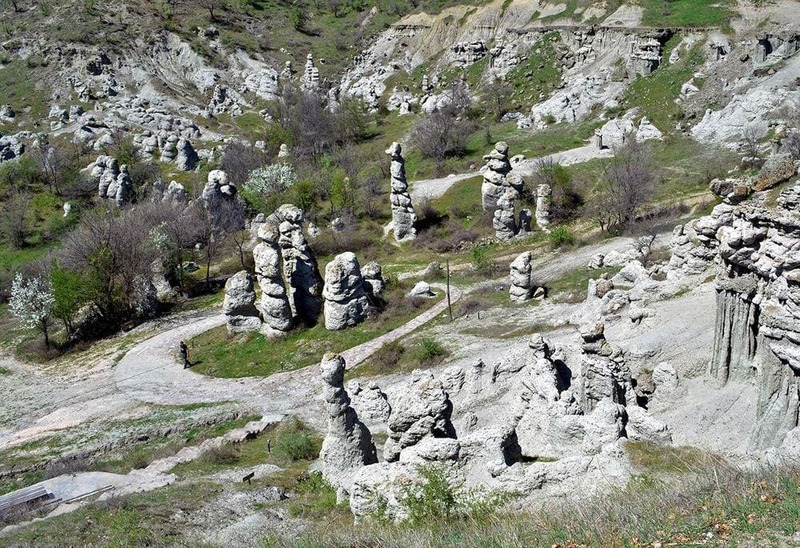 Group of interesting stone formations – tall stone pillars and walls. Site of legends. Peshna – Southwestern. This cave has an enormous entrance room with approximately 30 m high ceiling. At the entrance of the cave are ruins of medieval fortifications. Site of legends. Slatinski Izvor – Southwestern. Longest known cave in North Macedonia, more than 4 km long. The beautiful cave has formed in Precambrian rocks and is adorned with a wealth of stalactites, draperies and other speleothems. Vrelo Cave – Skopje. Interesting cave and spring with two lakes in it. The lake of the spring is very deep – it has been dived up to the depth of 212 m but it is possible that the cave is some 330 m deep – one of the deepest underwater caves in the world. Duvalo – Southwestern. Fumarole – small crater which emits carbon dioxide and sulfur dioxide. Often the yellow deposits of sulfur are seen here – sulfur was mined here in the past. St. Naum Springs – Southwestern. Group of powerful springs – discharge of underground stream from the Prespa Lake. Average discharge of the spring is 5.5 m/s. Korab Falls – Polog. Seasonal waterfall with a single plunge. The estimated height is 100 – 138 m, this is the tallest plunge in Balkans. Smolare Falls – Southeastern. 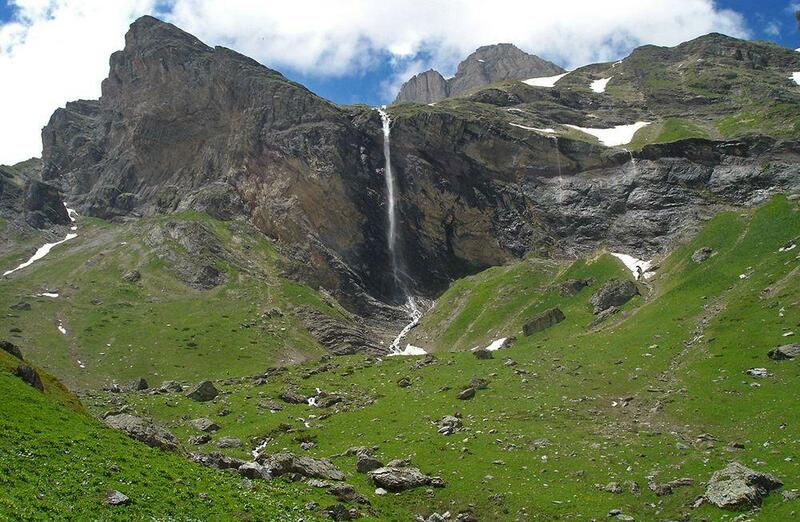 Gorgeous, 39.5 m tall waterfall which falls over a black rock. Begovo Pole – Skopje. Karst field – large mountain meadow with rare plants. Only here is found Macedonian saffron (Colchicum macedonicum). Small streams, which flow through this meadow, disappear in sinkholes. Lake Ohrid – Southwestern and Albania, Korçë. Deepest lake in Balkans with unique fauna and flora – many species of fish, molluscs and other organisms are found only in this lake. Most likely the life in this lake has developed for millions of years with limited contacts to other aquatic ecosystems. Oriental plane in Ohrid – Southwestern. Enormous tree (Platanus orientalis) with a girth of 18.81 m and height – 18 m. Tree was planted in 868 AD. Heraclea Lyncestis – Pelagonia. Ruins of ancient Greek and Roman city. Founded in the middle of the 4th century BC. Impressive are the remnants of Roman theater and basilicas with beautiful mosaics. 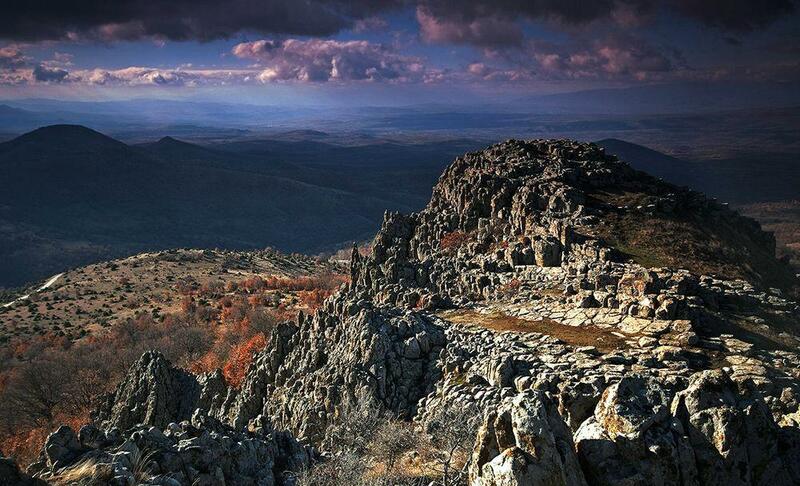 Kokino – Northeastern. Unusual megalithic monument which was created in the Bronze Age. First traces of human occupation in this settlement are from the 19th century BC but most artifacts are from the 16th – 14th century. Site contains two stone platforms with so called "thrones". This is considered to be an ancient observatory where 12 lunar years with 12 months in each are marked. Ohrid ancient theater – Southwestern. Well preserved remains of a theater built by Ancient Greeks around 200 BC. It was buried under the soil and accidentally discovered in the 1980ies. Stobi – Vardar. Ruins of ancient city which originally was founded by Paeonians, later capital of Roman province of Macedonia Salutaris. Contains remnants of many Roman structures – basilicas, palaces, baths, theater, synagogue. Ohrid Old Town – Southwestern. Picturesque town at Lake Ohrid with well preserved old street network and old houses. Most buildings were built in the 18th – 19th century. Kale Fortress (Skopje Fortress) – Skopje. Massive fortress which rises on the hill above the city. First stone fortress was built here in the 6th century AD, current one – in the 10th – 11th centuries. Markovi Kuli – Pelagonia. Group of medieval towers (13th – 14th centuries) which are built on a beautiful natural formation – unusually shaped rocks of granite and gneiss. This cliff has been inhabited since the prehistoric times and in the 9th – 10th century AD here was one of the largest settlements of Slavs on the Balkan Peninsula in this time period. Cave church of St. Archangel Michael in Radožda – Southwestern. 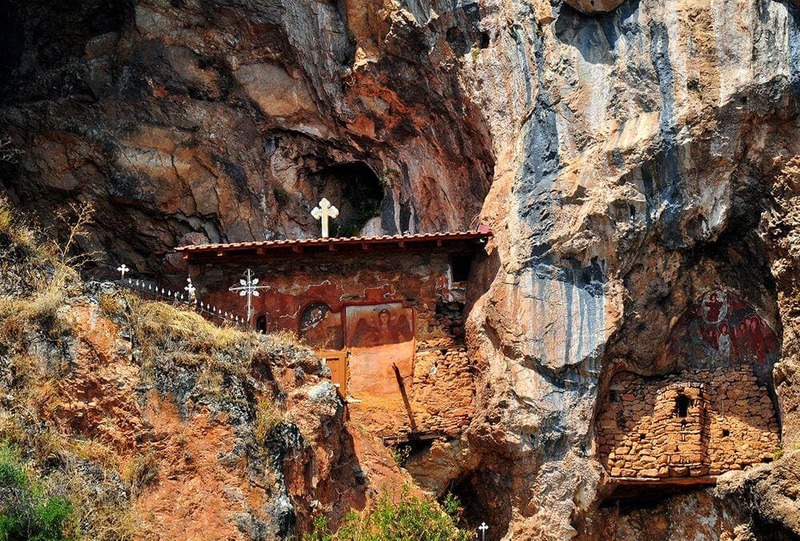 This medieval cave church was built inside the cave and is adorned with frescoes. Most frescoes are made in the 14h century, one is older – from the 13th century. The older fresco – "Miracle of Hona" – shows innovative techniques for its time. Church of St. John at Kaneo – Southwestern. Medieval church in a beautiful setting – on a hill above Lake Ohrid. Architecture of the church is influenced by Armenian architecture, it was built before 1447. Gorno Nerezi St. Panteleimon church and monastery – Skopje. Small church in Byzantine style, built in the 12th century and surrounded by old monastery buildings. Frescoes inside the church are outstanding examples of Comenian Age Byzantine art. Some art scientists consider that these paintings are early predecessors of Renaissance art. Kurbinovo Church of St.George – Pelagonia. Small, very old church, most likely built in 1191 in Byzantine style. Church contains beautiful frescoes which are some of the best examples of the Macedonian Renaissance – realistic style in art preceding the Italian Renaissance. Ohrid Saint Sophia Church – Southwestern. Very old church, possibly built in the 9th century. Very valuable are the beautiful Byzantine frescoes from the 11th, 12th and 13th century. Lesnovo Monastery – Eastern. Well preserved medieval monastery which was founded in 1341. In the caves around the monastery are caves – medieval hermitages. Church is built in Byzantine style and has beautiful Byzantine frescoes. Other monastery buildings are from the early 19th century. 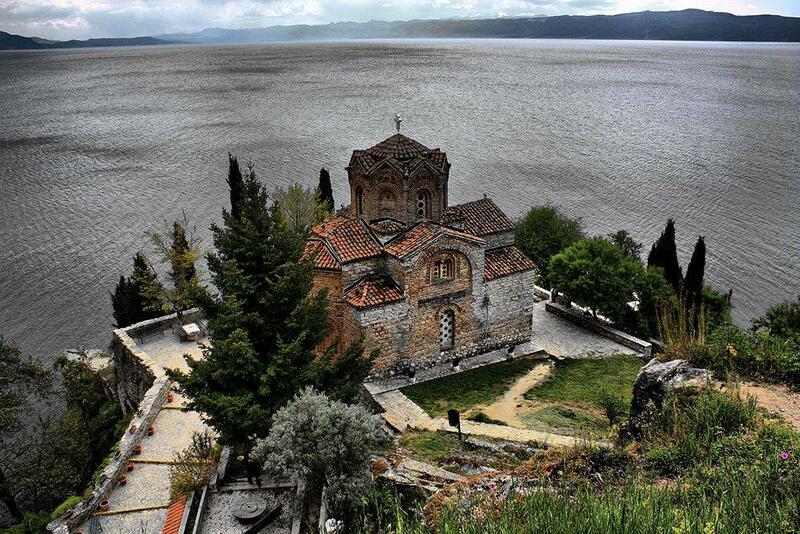 Ohrid Saint Panteleimon monastery – Southwestern. Most sacred Christian site in the country. This monastery was established in the late 9th – early 10th century. This is the location where Glagolitic alphabet start to spread, here is also a unique collection of more than 800 medieval icons. Treskavec Monastery – Pelagonia. 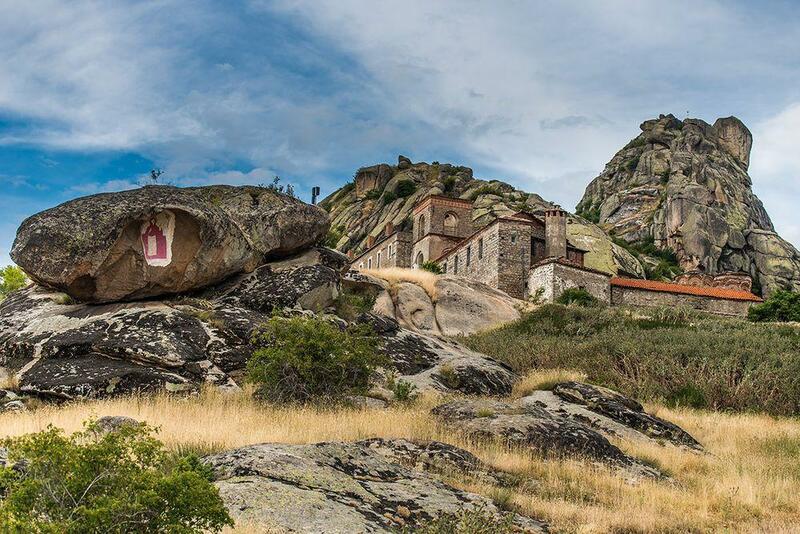 Historical monastery in mountains, founded in the 12th century and rebuilt in the 14th century in Byzantine style. Contains rich collection of Byzantine frescoes. Since the fire in 2011 it is in ruins. Arabati Baba Tekḱe – Polog. 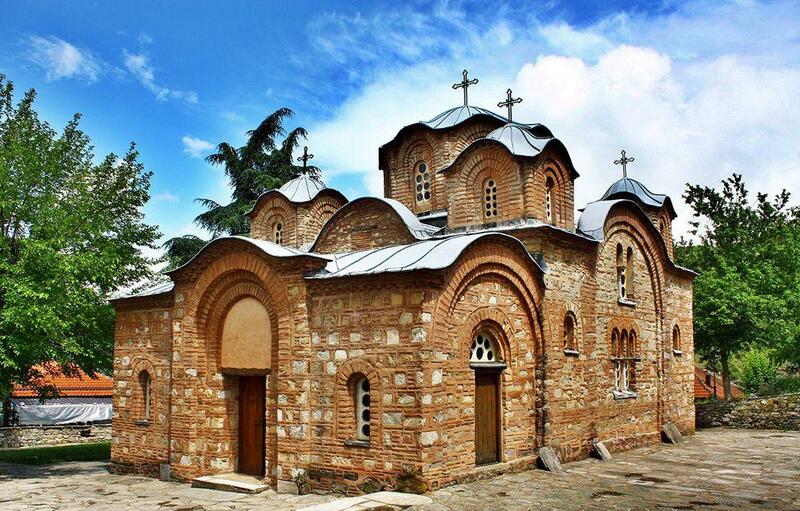 Best preserved Bektashi monastery in Europe, originally built in 1538. Now this is an extensive complex of buildings and gardens. Šarena Džamija – Polog. Ornate mosque, originally built in 1438. Site includes gardens and several more buildings. Facade of the structure is covered with paintings – floral pattern. Interior also is adorned with gaudy frescoes. Skopje Aqueduct – Skopje. 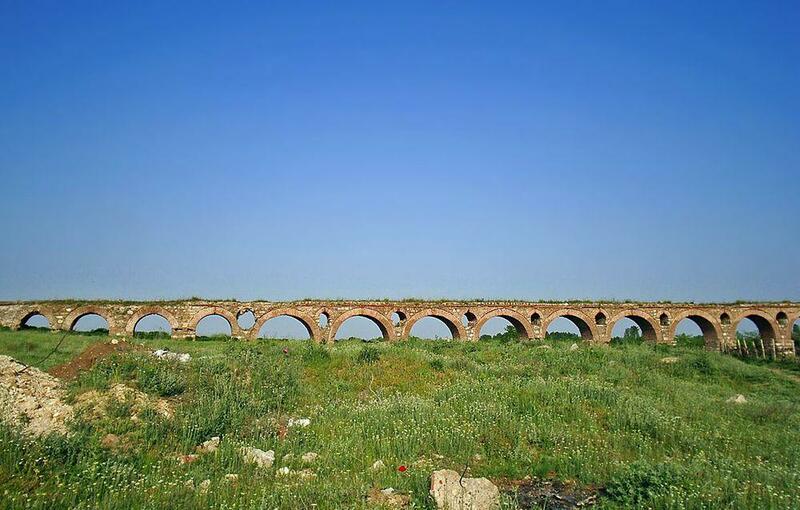 386 m long fragment (50 arches) of an impressive aqueduct which was in use until the 18th century. It is not known when it was built. Byzantine churches and monasteries – some of the most interesting landmarks in North Macedonia are some old churches which contain valuable frescoes – possible predecessors of European Renaissance. Archaeological heritage – these landmarks are rather diverse and belong to various cultures. 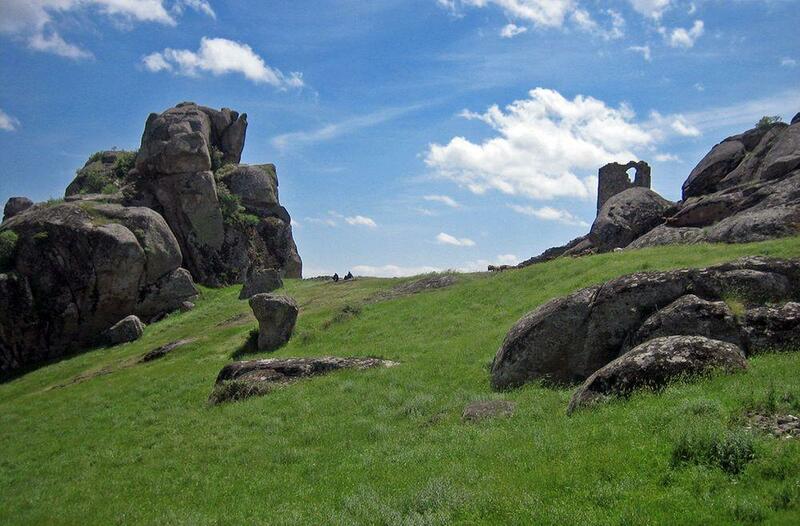 Intriguing are the discussions around the Kokino megaliths – possible ancient observatory. 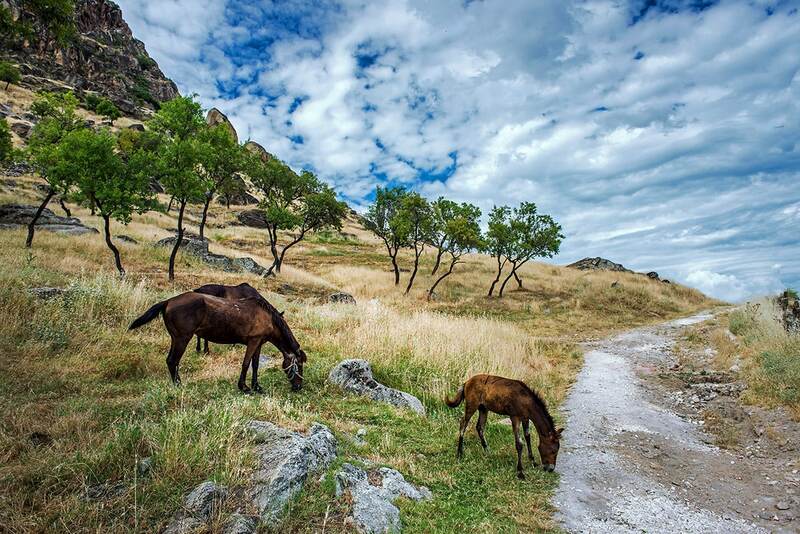 For 91 Days in Macedonia is collection of stories, photography and advice from three months spent in one of Europe’s least-discovered countries. Mike and Jürgen are travelers who spend 91 days in various locations around the world, capturing the history, lifestyle and culture of their temporary homes. With the enthusiasm of newcomers, they spent three months exploring the Republic of Macedonia, leaving no stone unturned, from the capital of Skopje to beautiful Lake Ohrid… and everything in between.